of digital paintings exploring the boundary between representation and abstraction. Inspired by the work of Vincent Van Gogh, Quayola has returned to the same countryside of Provence 125 years later. The landscapes serve as a point of departure – a pretext to shape an inner motion and vision. Through the misuse of image-analysis and manipulation algorithms, Pleasant Places challenges the photographic image and proposes alternative modes of vision and synthesis. Familiar landscapes – filmed in Ultra-High-Definition – is shown with meticulous attention to details and to the anthropomorphic shapes of the trees. Then, through the use of custom-software, the detailed texture of the foliage is reduced to two-dimensional masses of volume veering towards abstraction. As the outlines of trees and shrubs get blurred, nature becomes dense and almost impenetrable. The resulting compositions remain, suggestively, suspended between representation and abstraction, between the depth of the natural scenery and the surface of the screen. In contrast to this vision, raw data-visualisations of colour and motion information follow in sequence the contemplative digital paintings to remind us what really lies beneath the surface. The Best Day（最好的一天） is a video artwork in the series “The Determination of Life” . The scene in this work was shot in the mountains of Wu-Lai（烏來）. The four artists firstly recorded a concatenation of their motions in this natural environment with 360 degree high-speed photography, and then edited the images into a video without the outset and the coda. By virtue of the concept of circle/circulation, the content of this video not only demonstrated a harmonious relationship between the nature and humanity but also emanated an aura of oriental philosophy. In Cézanne Unfixed, the relationship between the painting and the museum in the installation photograph is blurred. In his time, Cézanne was influenced by developments in science to challenge the ways of modelling space and volume, and this artwork continues that work. The brushstrokes of Cézanne break from their canvases to inhabit the spatial dimensions of the museum while the architecture flattens into the surface of the image plane. While old barriers are fractured, new barriers are created in the medium of this artwork, the digital video file. The art video Critical Transitions, was inspired by discussions with ecologist, scientist and musician Marten Scheffer, who studies the nature of change. Critical Transitions is an artistic visualisation of processes that are constantly going on around us. A system gradually builds up, and eventually it sometimes reach a tipping point where it suddenly changes. After that, it might stabilise in a new system. In the video there are three sequences, each about 10 minutes in length, inspired by such processes. The video can be viewed as an abstract painting in motion or as a landscape in flux. The climate, forests, coral reefs, financial markets and even our minds occasionally reach a tipping point where they go through a radical transformation. Foreseeing such critical transitions or even noticing that they are unfolding is challenging as they are embedded in the omnipresent permanent flow of change. Dazzled by myriads of such minimal motions, how can we see that they sometimes erupt into transforming change? Immersed in chaotic and turbulent transformation, how can we see where we are going? Science seeks universal early warning signals for critical transitions, but we often only realise the world is not the same anymore in hindsight. Xindian Boys consists of four artists par excellence, namely Tsong Pu, Chen Shun-Chu, Wu Tung-Lung, and Su Hui-Yu. They respectively belong to three different generations and adopt different creative media such as painting, installation, photography, and video. It is a rare example of teamwork-oriented artist group in Taiwan over the recent years. In November 2015, the world-renowned exhibition Paris Photo invited them to exhibit The Determination of Life, their first collaborative series completed in 2012. The Best Day is a video artwork in this series. The scene in this work was shot in the mountains of Wu-Lai. The four artists firstly recorded a concatenation of their motions in this natural environment with 360 degree high-speed photography, and then edited the images into a video without the outset and the coda. By virtue of the concept of circle/circulation, the content of this video not only demonstrated a harmonious relationship between the nature and humanity but also emanated an aura of oriental philosophy. Norwegian artist Tone Bjordam makes projects related to nature, perception and ecology. Bjordam works with video, animation films, nature photography, abstract and nature-inspired paintings, intricate, detailed drawings and sculpture installations. 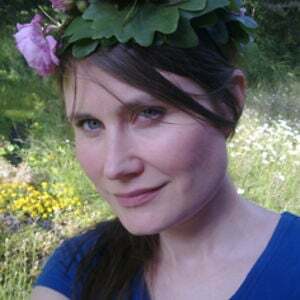 She has a Masters Degree in Fine Arts from The Art Academy in Oslo, Norway, and exhibits artwork internationally. Bjordam’s art, which takes the form of videos, animation films, nature photography, abstract paintings, intricate drawings, and geometric sculptures–goes where science alone cannot. Her art has the unique power to engage viewers empathically and aesthetically in a way that often simulates meaningful experiences with the natural world.